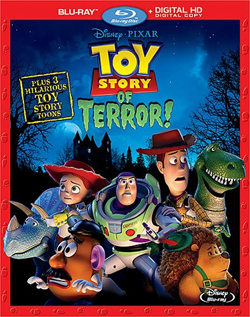 (Release Date: August 19, 2014)  Pixar produced "Toy Story of Terror!" for ABC during the Halloween 2013 season, reuniting all of the beloved characters of the "Toy Story" series for a semi-spooky story wherein Woody (voiced by Tom Hanks), Buzz Lightyear (Tim Allen), Jessie (Joan Cusack) and friends go in search of Mr. Potato Head (Don Rickles) during a dark and stormy night at the SleepWell Motel. What opens as an affectionate tribute to classic horror pictures of oldthings open with the gang watching an old B&W vampire movie on TVbecomes gradually innocuous as it goes. Running 22 minutes, the short film forgets it's supposed to be scary (or at least a spoof of the genre) by the second half, instead focusing on Jessie learning to overcome her own fears in order to come to Woody's rescue. Though more could have been done with this particular premise, the slightness of "Toy Story of Terror!" does not curtail its high spirits and visual verve. "Toy Story of Terror!" is primarily set at night in low-light surroundings, but Disney's 1080p transfer works out these limitations swimmingly. As befits any Pixar-made effort, the computer animation is gorgeous, colorful and razor sharp. There isn't a hint of banding or edge enhancement or, for that matter, anything else that could be looked upon as a negative characteristic of its picture quality. The disc's 7.1. DTS-HD MA is subtly fuller than the 5.1 track also offered, but both sound terrific, if prominently kept to the front speakers. When sound effects, such as a creaking door, are unleashed from behind, the effect is appropriately startling. A nice job all around. "Team of Specialists" (11:53, HD) - a behind-the-scenes look at Pixar Animation Studios and the making of "Toy Story of Terror!" Made for television to fit within a half-hour time block, "Toy Story of Terror!" is a brief but entertaining addition to the series canon. Disney's Blu-ray release comes with an audio commentary, three more "Toy Story" short films, and a bunch of other worthwhile extras. Put all together, it is an engaging package that is easily recommendable.